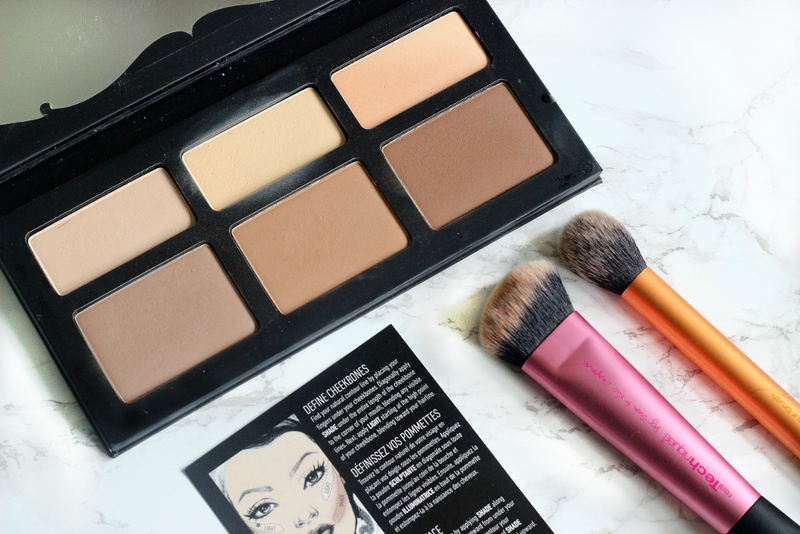 Ladies I want to introduce you to...the BEST contour palette I have ever seen, let alone owned and I am so exited to be reviewing it for you! 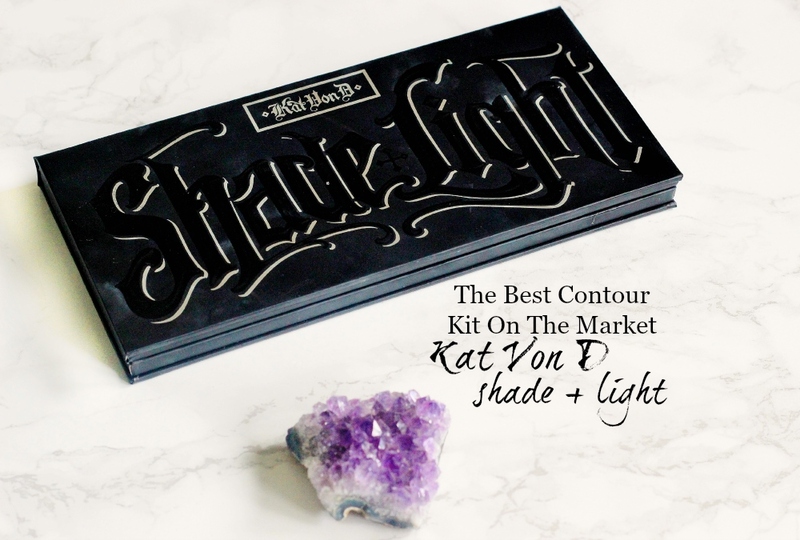 I picked up the Kat Von D Shade + Light Palette ($46.00- £30) when I placed my Sephora order post here back in May. By the way guys you can skip the customs from sephora and order it here, if you're from the U.K. 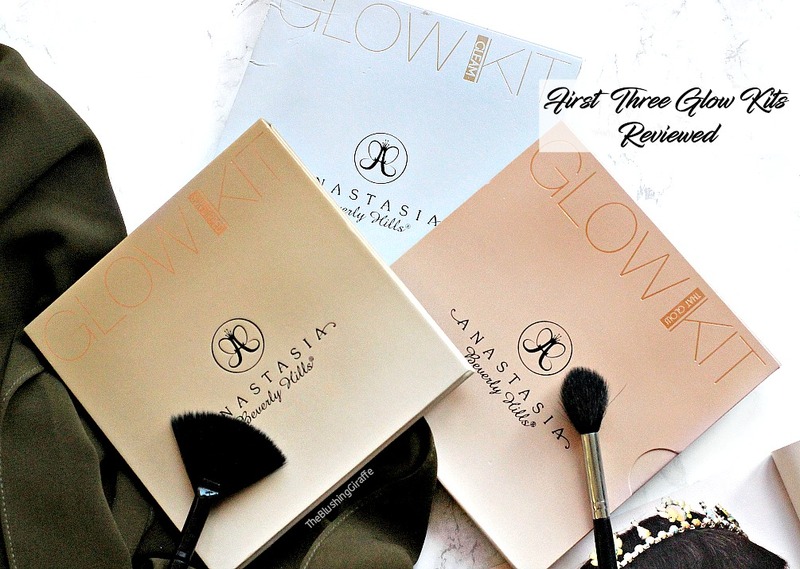 Although I had seen many rave reviews about the Anastasia Beverly Hills original contour kit, the shades just didn’t draw me in enough to purchase it. I felt like the grey toned one wasn’t quite pigmented enough and the highlight shades (other than banana) weren’t my cup of tea. To be honest I didn’t really see the need for a whole palette when I would only end up using one or two of the shades. Plus the price-tag was pretty steep! When this palette came out I watched as many YouTube videos as I could and quickly realised it was the one I had been waiting for. Starting off with the packaging as always, it is made of sturdy cardboard so it’s light enough to travel with and I love the edgy vibe. It’s black and silver, its sleek and it’s pretty compact too. 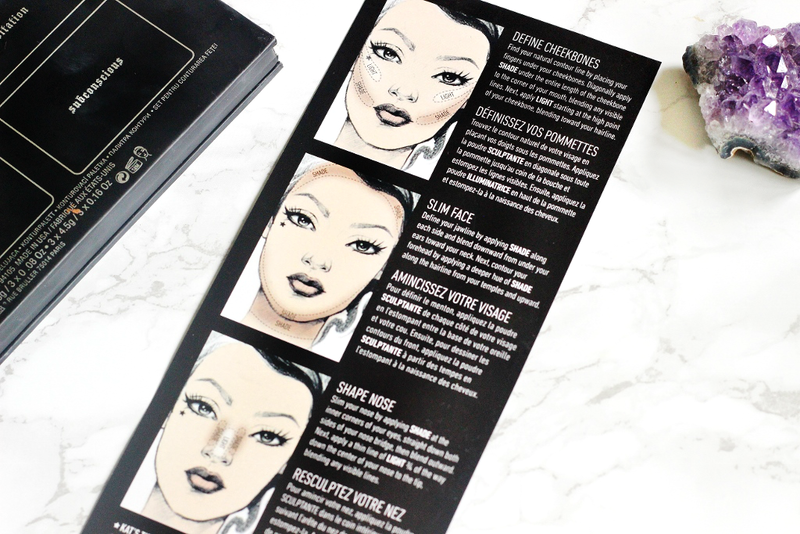 The box the palette comes in is identical to the palette’s packaging and you also get a handy guide for how to define cheekbones, slim the face and shape the nose. 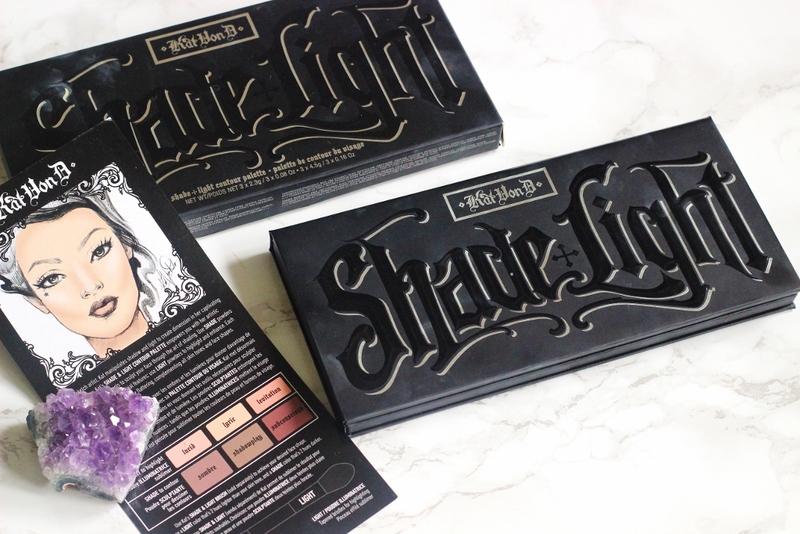 The font on the palette is in a distinctive tattoo style which tie’s in with Kat Von D’s branding and on the back of the box are all the shade names and the colours. Inside the palette is a full sized mirror which again is helpful for travelling and it closes shut with secure magnets so I wouldn’t be worried when putting it into my makeup bag and taking it along with me for a long trip. 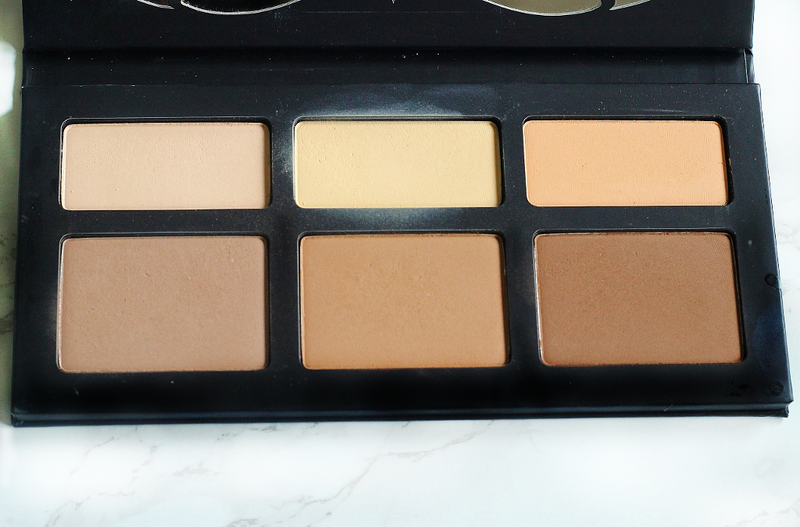 The shade and light contour palette has 6 different matte powders, three which are highlight shades and three which are contouring and bronzing shades. The highlight powders are probably half the size of the bronzer ones and they contain 2.3g of product each. The bronzer shades contain 4.5g which is a very generous amount and they’ll last for a long time. What I most appreciate about this palette are all the shades are distinctively different. I hate it when brands stick really similar shades in one palette and pretend you have a great range. With this contour palette each shade does have a purpose and can be used for different things when adding shade and light to face! Lucid: A pale slightly pink/beige toned powder which’ll work better for brightening up the under-eye circles for those of you with pale/fair skin. I sometimes like to mix this with the yellow shade next to it if I feel like my concealer is a touch too close to my skintone and if I can’t be bothered to get out a face powder, I also use a little of this shade around the nose and mouth - the places where my base tends to migrate from first! Lyric: my FAVOURITE yellow powder EVER. Yes I love this more than my much raved about Ben Nye Banana powder because it’s a lot less messy and the powder is super fine yet very pigmented. Don’t get me wrong this can be overdone, so a little goes a long way and boy does this set concealer like a dream! It brightens up the face, keeps concealer in place and doesn’t look cakey at all, one tap is all you need. Lyric will work well for most skintones which are light-medium and deeper. If I could buy this shade individually I 100% would. If I could change ONE thing about this palette it would be that the shade lyric is the same size as the contour/bronzing shades - know I’ll hit pan on it first. 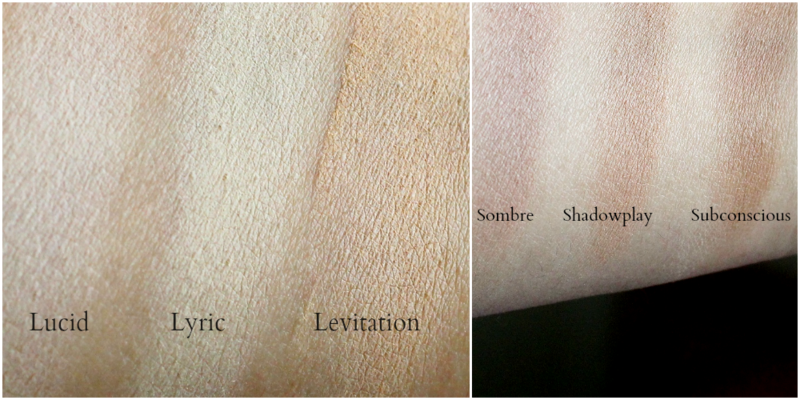 Levitation: A pale orange shade which swatches a lot less intensely than it looks in the pan! I think this would be the perfect setting shade for my beautiful deep skinned ladies. Also the orange tone can work well at correcting dark/ashy tones. Although it is easier to use a corrector underneath your concealer, a touch of this works decently. The times I’ve used this are when my concealer is a little too light, it tones down the yellow a smidge and leaves a flawless finish. Sombre: One of the best grey toned powders I have ever seen, its mimics a shadow so well that you can really achieve a chizeled look. Oh and trust me, I have become quite a chubby bunny as of late so I’ve been putting this to the extra test and I LOVE it. Also for any of you who like to nose contour a little this will be your best friend. The lack of warmth means it’ll be very hard for you to get a smudgy or muddy looking nose which is always a good thing!! I love this shade so much, it is perfection! Plus it’ll work well for all skintones from fair-deep olive. Shadowplay: Deeper and slightly warmer than Sombre, meaning you can get a great contour with this as well as a touch of warmth too. I’ll go for this shade if my foundation is quite light, one swipe of this will add definition and when it is blended around the perimeters of the face it gives me a healthy warm look. It’s almost on par with my HG bronzer...almost! Again another gem of a shade and one that I use frequently. Subconscious: The deepest shade in the palette, obviously this will make a wonderful contour shade for all the deep-skin beauties out there! I LOVE that Kat Von D made sure that each of the shades would cater to a specific skintone in particular and also that the deepest shade doesn’t have a red or orange tone...it has a grey tone too! I find that a lot of the time when you get bronzers this deep they don’t have that vital grey undertone to form a shadow, but this shade does and although its a little too deep for me to pull off in a rush, I can make it work. If I’m going for a warmer look I’ll first contour with shadowplay and then I’ll add a touch of this shade directly under the cheekbones (using a smaller brush) and my face instantly looks sharper and well defined! The powders are all pigmented and quite soft, when you put the brush into the pan it can kick up some powder which shows how finely milled it is. I don’t mind this too much, but I have found that it can settle onto the packaging (I’m not sure how well you can tell from the photos around the yellow shade). I find that one stroke of the brush is enough to get the desired look on the face which means that the pans should last a decently long time, even Lyric! Also these powders blend like an absolute dream, though they are pigmented, you don’t need to spend ages blending to achieve a flawless finish. 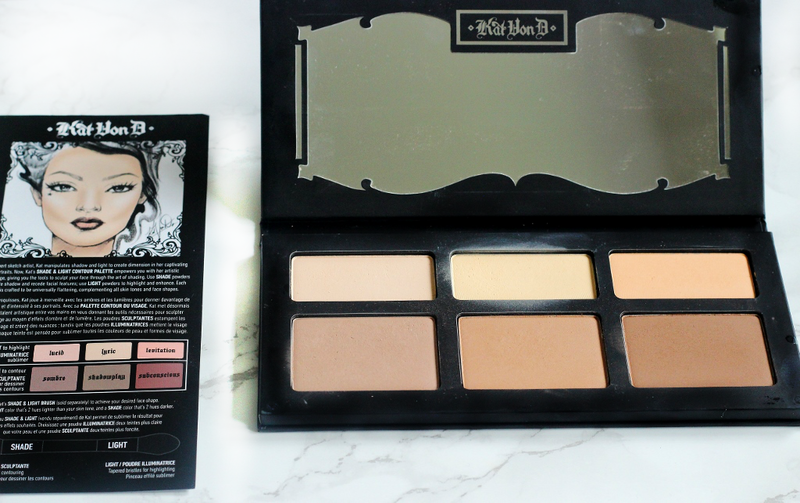 I should also mention here that Kat Von D has created a double sided brush to go along with this palette and it is $10 cheaper, personally I didn't feel the need to pick it up (I already have an army of brushes!) but it's worth considering if you're looking for a decent tool to use. I think the guide sheet that is included is great, even with all the tutorials out there it can get a little confusing if you’re a beginner at this contouring stuff! On it is written ‘each hue is created to be universally flattering and compliment all skintones and face shapes’ and I could not agree more. Like I’ve already mentioned, the deeper shades all have a grey undertone and if you look at the palette they’re almost in sets of two. The lighter ones for the fair people, the middle for medium skintones and the two on the right for the deeper skintones - which is awesome, she has truly taken into account everyone. However as explained above, I can and have utilised all the shades which is brilliant. The whole reason why I didn’t want the ABH one was because I knew I wouldn’t use every single shade - with this beauty my mind is at ease knowing that each pan is fantastic and again phenomenal value for money! I really really think this contour kit is fantastic value for money, even if I didn’t have a part time job and a little disposable income to buy makeup it is well worth saving up for. The powders are buildable, blendable, finely milled and really do cater for every skintone. If you are super pale or super deep in skintone this won’t be as useful to you as it is to me, which is a shame. However I’ve heard she is making new palettes for those specific skintones, which is worth looking out for! But all in all I’m pleasantly surprised that most people will be able to use each of the shades - something you won’t find with the majority of contour palettes. Pros: The contour shades are all grey in tone so regardless of your skintone you can achieve a truly sculpted look! The highlight shades are all matte which I love and they’re all pretty different so you can mix and match them depending on what kind of colour you need. The powders are finely milled and blend easily. They’re also super pigmented so a little really goes go a long way. 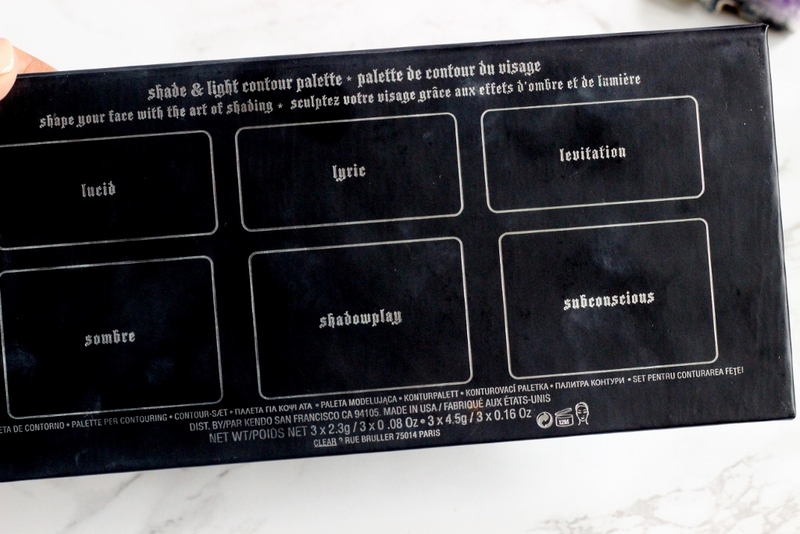 The palette includes a full sized mirror and the packaging means it’s light enough to travel with. There is a handy guide on how to contour if you’re new to it. The pan sizes for the contour shades are very generous and I think the whole palette in general will last a decent amount of time. It’s fantastic value for money, high quality and long lasting on the skin. It does what it says and there’s almost nothing I would change! Cons: I mean this isn’t a biggie but I do wish the yellow shade was bigger, just because I know that I’m gonna hit pan on that first! It would be cool if you could choose which pans go where and the size of them. But like I said not a biggie! Also forgot to mention that it's only available via Sephora so you do need to save up but I PROMISE you its worth it. Repurchase? Yes 100% and I recommend this to anyone looking for a fantastic contour kit! Do you have a favourite contour kit? Or do you just stick to individual powders and bronzers?